« Azura delay – how fair is the compensation? Not a ‘snatched image’ in the way the others have been, e.g. pulled from webcams or video streams, but snatched in the sense that I had to take this quickly. I happened to be in Liverpool at a meeting in the Liver Building today. 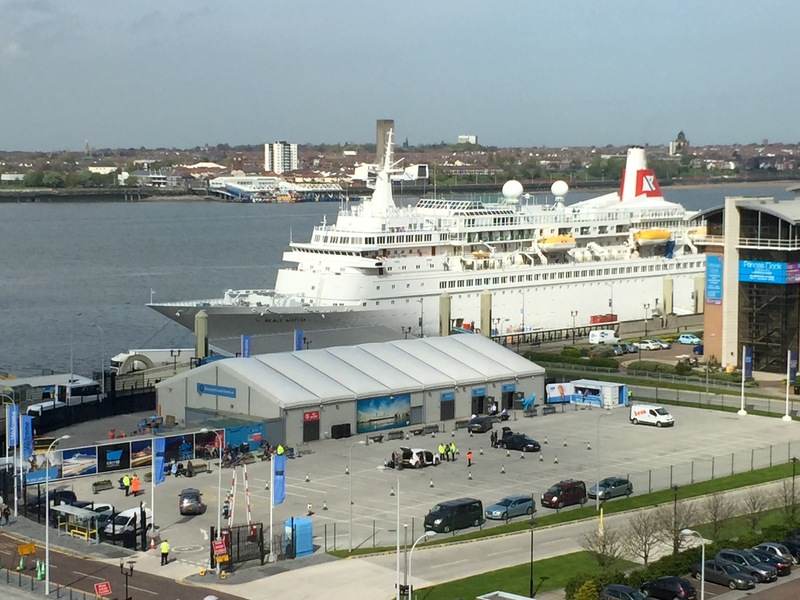 I knew that Black Watch was on a turnaround at the cruise terminal and I was hoping I could take a picture, and around 10:30 or so I had a brief opportunity to do so. Obviously you can see Black Watch; the structure just in front of her is the cruise terminal building itself. The picture was taken through an office window from a few floors above ground level in the Liver Building; the room I was in just happened to have the right view. By lunchtime the rain had started and the site was lot grimmer-looking, but also busier. There were numerous cars in the car park in front of the terminal dropping off passengers, there were porters pushing luggage trolleys around and it was a hive of activity. Access to the terminal was restricted (quite correctly) so I couldn’t get too close, but I did hear an announcement from Black Watch’s deck PA system and for a moment I felt quite envious.